Beautiful 5 Bedrm w/Pebble Tec Pool in Popular area! Fresh 2 Tone Neutral Paint! Bright Open Kitchen w/Granite Counters, Maple Cabinets, Breakfast Bar, Eat-in Kitchen & Gas Stove!! Guest Bedrm & Full Bath Downstairs Other 4 Bedrms/2 Bath Upstairs! Master w/Dual Lg Walk-in Closet, Dual Sinks, Separate Shower & Garden Tub! Upgraded Ceiling Fans & Lighting Through Out! Soft Water Sys. & Back Yd Dr in 2.5 Car Garage!. 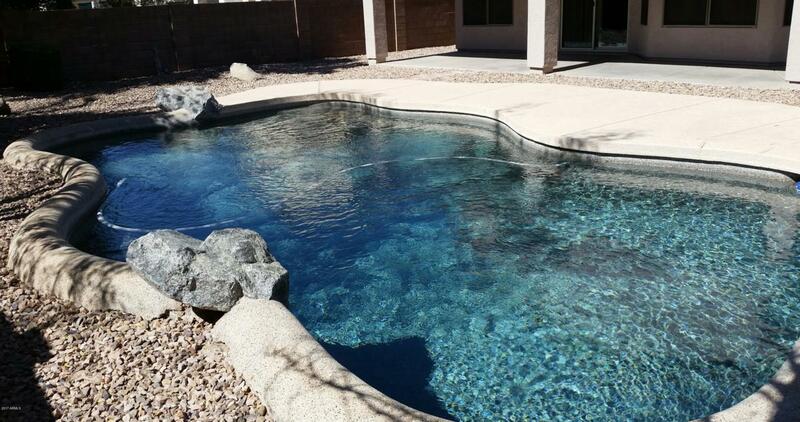 Front & Back Desert Landscape & Pool Maint. is Included in the Rent! RV Gate for Parking Vehicles Lower Than Back Fence! All Located Near 202 Freeway, Shopping, Restaurants, Entertainment & Schools!! $150 Non-refundable Processing Fee to be Paid Upon Application Approval. Listing courtesy of Desert Wind Property Management And Real Estate.